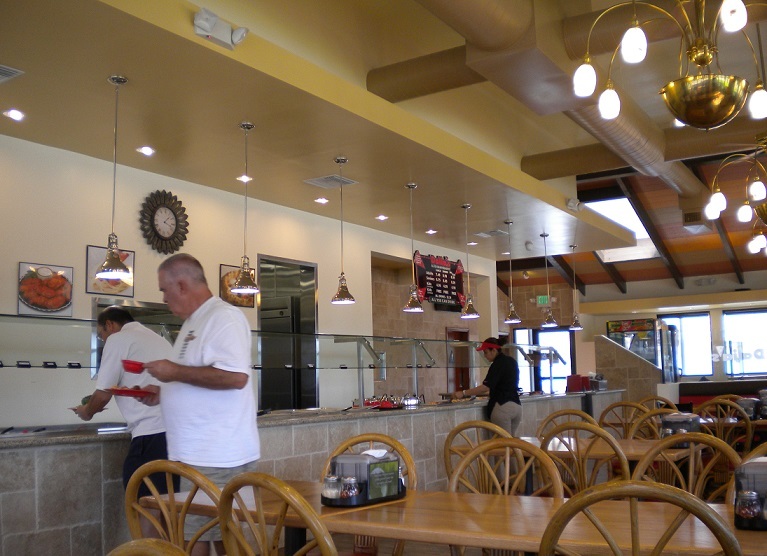 In the busy Chino Hills Marketplace, the sitdown Mexican restaurant Las Cascadas opened in December 2010 in the space previously occupied by the mediocre Salsitas, followed by Sandra’s and El Tepeyac. I had dinner there with a couple of friends the other night. Once you’ve fought your way through the ill-designed parking lot, the restaurant is kind of snazzy: a broad bank of windows, solid tables, high-backed wooden chairs and a continuous, sofa-like bench along the window frontage. The decor is simple and tasteful. It was Taco Tuesday and, as long as you get a bar drink (basically, anything but a soda), you can order off that menu. 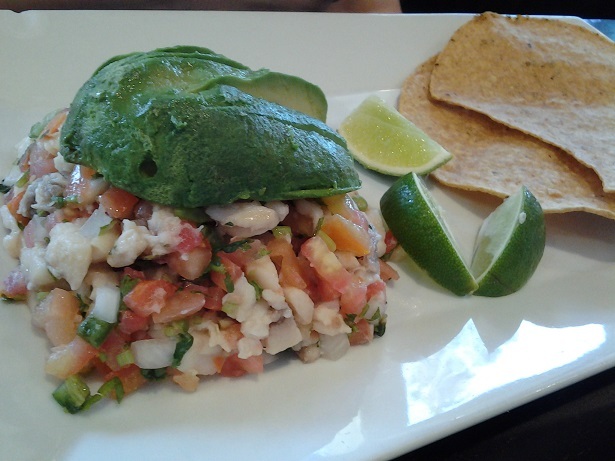 I got three $1.50 tacos (pictured above) and a horchata ($2.50); one friend had a chimichanga, hardshell beef taco and bean and cheese sope ($1.50 each, pictured below), the other the fish ceviche ($9, dinner portion, pictured at bottom). Now, let’s be clear. 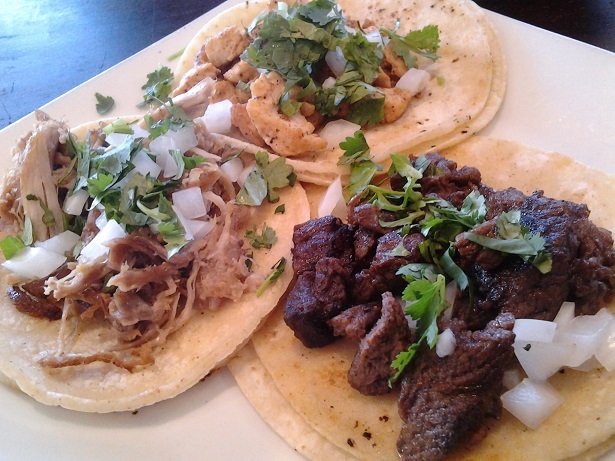 You could get better Mexican food at many taquerias in the region. There is a reason you don’t automatically think of Chino Hills and Mexican food together. (Asian food is the thing to get.) That said, the atmosphere was really comfortable, the interior well designed, one of the more impressive Mexican restaurant interiors in these parts, and the food pretty good for a white person’s Mexican food experience. It’s like a hip El Torito. And if it’s good enough for Gov. Jerry Brown, who dropped in unexpectedly for dinner in April, then you might like it too. Pieology, a pizza parlor, is coming to Rancho Cucamonga, according to its website. The current locations are Irvine Spectrum and Fullerton. Pieology is a fast-fired pizzeria where the pizzas are done in five minutes. It replaces Okawa Sushi and Grill Relax the Back on Day Creek Boulevard, just below Foothill Boulevard and Victoria Gardens, in the Sears Grand center. * In related news, the Slater’s 50/50 coming to Victoria Gardens is slated (har!) to open in July, and Brio Tuscan Grille, a national Italian restaurant chain, will open in the VG’s former Borders space later this year. Wednesday’s column tells the history of a long-lived Claremont gift shop, Raku, that closed earlier this year. And let me say, without my blog, this column might not exist. I posted news of Raku’s closure here, several of you commented (Meredith Evans and George Goad’s comments made the column), and Doug Lawrie, the store’s co-founder, saw the post somehow and emailed me. Then he put me in touch with Jerry and Peggy Miller, the other co-founders. Seemed like a piece of Claremont history that ought to be told. Rather belatedly, here it is. This commercial was filmed at B and Laurel streets in downtown Ontario. The bicycle shop isn’t real, but the antique store is. Nice to see a lot of people downtown, even if that aspect is fictional too. * Sunday’s column begins with an item about the commercial, followed by more news from around the valley. 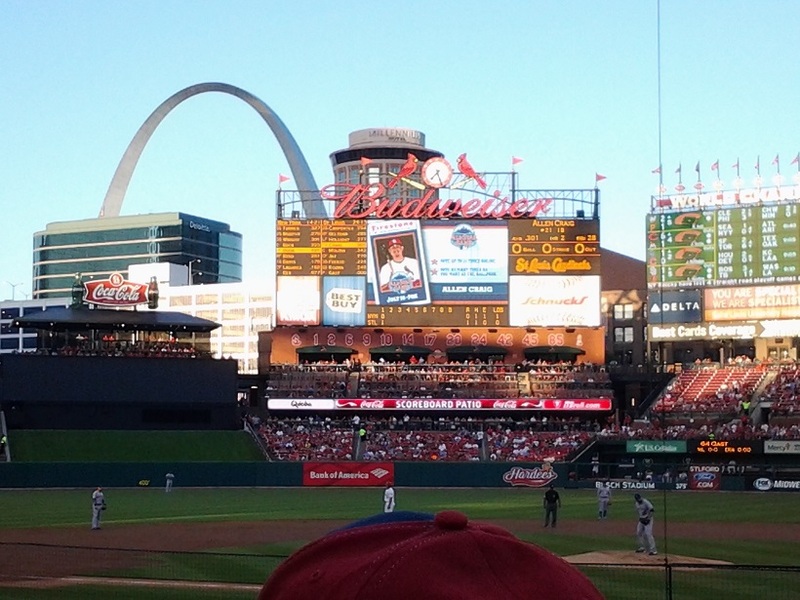 View at a Cardinals game, May 14. A mere three readers said they wanted to hear more about my vacation, and I can’t blame the rest of you, so I’ll limit this to my blog. St. Louis, the nearest big city when I was growing up, has a certain mystique for me, but it’s not a city too many Californians would choose as a vacation destination. As with any big city, there are interesting things to see and do, and St. Louis is old enough (founded 1764) that some of them are quite old. This visit, in fact, I visited Cahokia Mounds, an Indian site that is thousands of years old. It’s a UNESCO World Heritage Site, a village that at its heyday, around 1250 AD, had a population of roughly 20,000, comparable in size to London or Paris of that era. (The traffic must have been terrible.) It’s also got the largest manmade earthen mound north of Mexico. Other activities this time were more modern, at least relatively. Ted Drewes frozen custard (since 1930) and Carl’s Drive-In (since 1959) are reliably great. The Delmar Loop has been named one of America’s 10 Great Streets. And the Public Library, after a recent $70 million renovation, has been restored to its 1912 Beaux Arts glory while updated where appropriate. It may be more impressive than L.A.’s Central Library. That’s just the tip of the iceberg that is St. Louis. Every visit I do a few new things and a few old favorites. Sometimes the new things become old favorites. There are plenty of intriguing-sounding places I still haven’t been despite numerous visits. For one, U.S. Grant’s home. Or places I want to return to, like Crown Candy Kitchen, where the 14-slice BLT has become nationally famous since my last visit; I go for the ice cream. The moral is that you can go to almost any city of size, not just the obvious ones, and find beautiful, inspiring, tasty, fun things to do. The former Sizzler on Base Line Road has been converted into something almost unique to the area: a pizza buffet. No, not just like Shakey’s or someplace where they have a buffet at lunchtime. I mean it’s all-you-can-eat all the time, like HomeTown Buffet. There is no menu to order from. Curious, I went there for lunch one day last week. I paid my $7.49 at the cashier for a buffet and $2.39 for a soda (“all you can drink”) and then checked out the offerings. There is pizza, obviously, seven or more at a time, even at 1:30 p.m. when I arrived. And there is salad, soup, pasta and garlic knots. They also have fried chicken, french fries and onion rings. And there is soft-serve ice cream, cookies and even chocolate-covered strawberries. The salad was fine, the Italian wedding soup not bad, and a ravioli was unexpectedly meaty. The pizza, oddly enough, was the weak link, blandly sauced, bready and unmemorable. I ate six slices anyway. It seemed like the thing to do. When I left, after 2:30, the buffet had eight pizzas out, and there were still a handful of customers. A manager told me that during the afternoon lull, customers can request a pizza, saving the kitchen from putting out a lot of food no one is there to eat. But by 5 p.m., he said, people start coming in for dinner ($9). Putting out individual-serving submarine sandwiches is under consideration, and customers can place to-go orders. 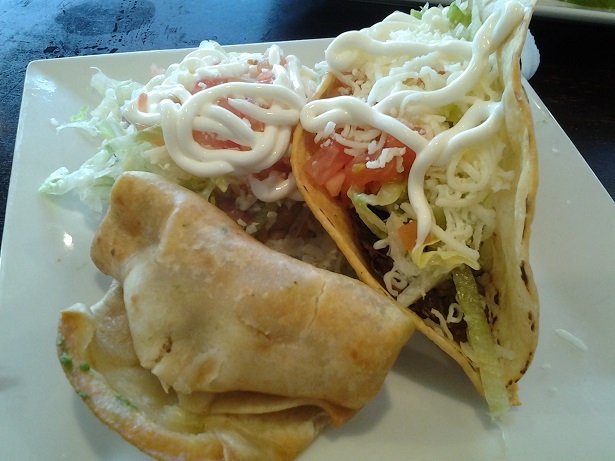 Dalia’s has six other locations in the area, most of them take-out or delivery only. 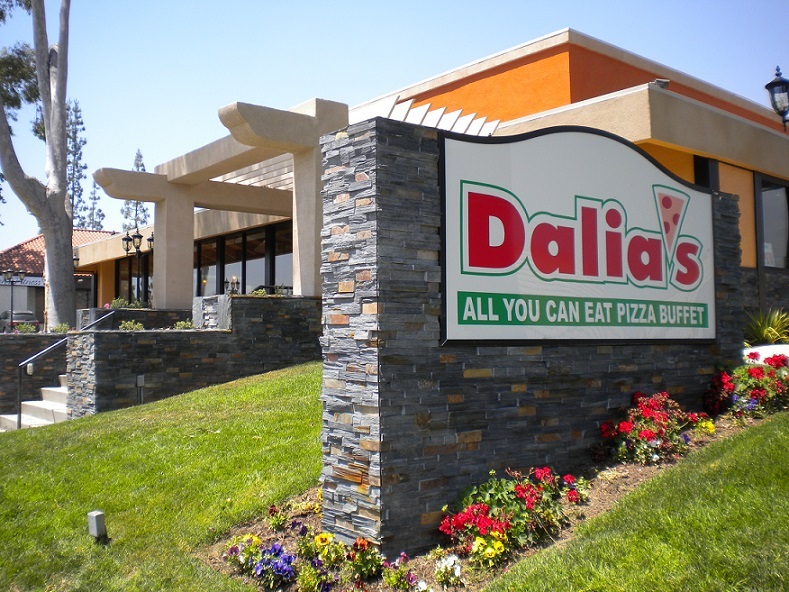 I thought Dalia’s pizza buffet might be unique, but CiCi’s Pizza, a Texas-based buffet chain, now has a location in Chino Hills (4200 Chino Hills Parkway). It’s an interesting concept and Dalia’s does seem to be trying. I might even go back for the novelty factor. I wish the pizza were better, though. While in St. Louis, I saw Chuck Berry in one of his monthly gigs in the basement club known as the Duck Room. Friday’s column tells all. 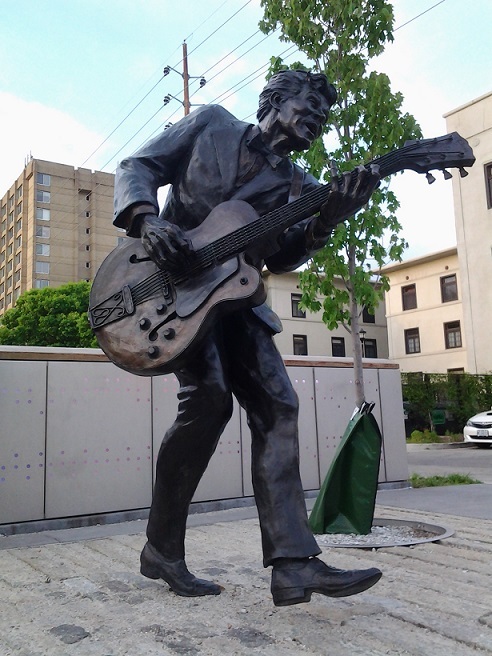 Above, the statue of Chuck on Delmar Boulevard across from the club. A call came in to my desk Tuesday afternoon. The caller identified himself and said he’d recently stumbled across an old blog post of mine about “how to know you’ve lived here a long time.” I allowed as how I vaguely remembered it. “Here is my question: Are you a person who is SERIOUSLY interested in local history?” the man said. Something about his intensity put me off, I guess. We had a halting back-and-forth about whether he’s ever read my work (he repeated that he had merely stumbled across my blog post and immediately picked up the phone to call), how he had once set linotype for the Progress Bulletin, how he didn’t like to waste his time. Oh brother. He had a self-serious “do I have an age-old conspiracy for you!” air about him, perhaps a complaint worrying him for decades like a pebble in his shoe, and the odds that whatever he was selling I would buy were growing poorer by the second. I told him I do from time to time write about local history, and to my mind, yes, I’m serious. Evidently this answer wasn’t sufficiently enthusiastic. “You just missed out on a great story,” the man informed me with a mixture of pity, disappointment and triumph. I sighed and said, “Whatever, man,” then hung up on him before he could hang up on me. If it turns out he knew where all the bodies are buried, and it’s not Bellevue Cemetery, I guess I blew it. Loyal? Stubborn? Whichever, I flew in and out of ONT for my vacation. They were so happy to have me, my first flight was canceled in an effort to keep me there longer. Sigh. Wednesday’s column has the details.